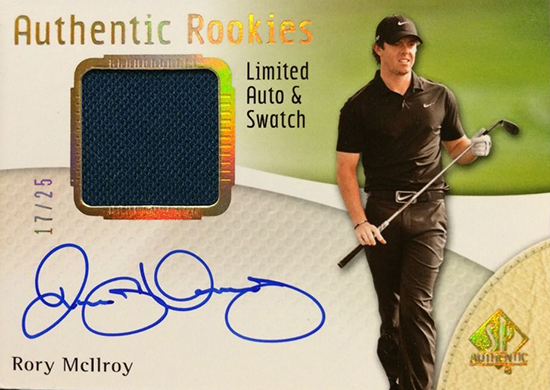 How High Will Values on Rory McIlroy Rookie Cards & Collectibles Soar? Rory McIlroy is young, but by no means is he a rookie. 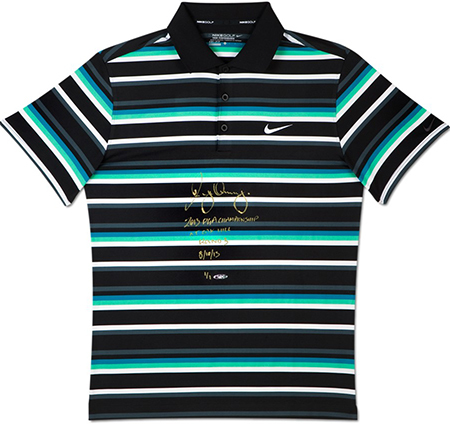 At 25 years of age McIlroy has already captured 14 professional victories including four majors (2011 U.S. Open, 2012 PGA Championship, 2014 British Open & 2014 PGA Championship). 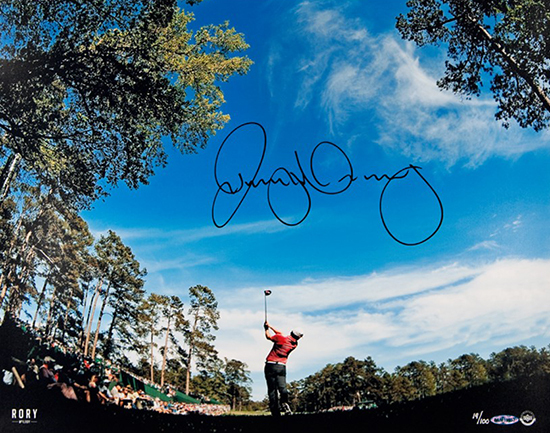 Having scored back to back victories in the last two majors and retaken the #1 World Ranking in golf has collectors wondering just how high the values on his collectibles might soar. It was back in August 2012 when Upper Deck was finally able to ink the Northern Ireland star to an exclusive trading card and memorabilia deal. 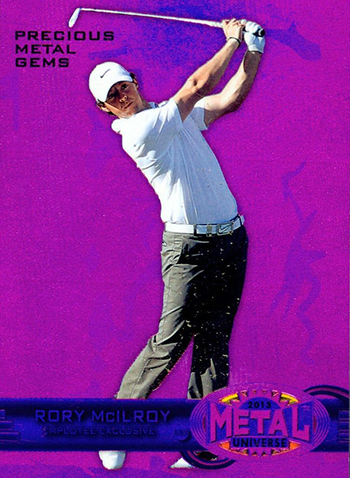 There were some promotional cards done for Rory by Upper Deck between 2012 and 2013, but it was not until the 2014 season that fans finally were able to score their first true rookie cards and a heavier mix of insert cards of Rory McIlroy from Upper Deck. Many believe Rory McIlroy is a once in a generation type of player who could ultimately give players like Tiger Woods, Arnold Palmer and Jack Nicklaus a run for their money in terms of all-time major victories, but only time will tell. He is certainly off to an amazing start though and with that comes increased interest in his authentic signed collectibles produced exclusively by Upper Deck. How high will some of these cards and memorabilia items ultimately be valued at? It really is anyone’s guess, but as of right now, they are most certainly on the rise. 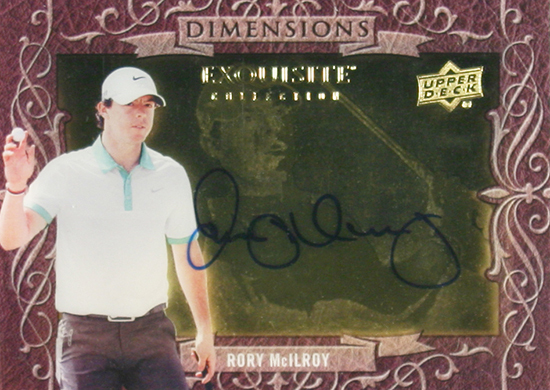 Below is a breakdown on many of the Upper Deck cards and memorabilia golf fans are pursuing hard from Rory McIlroy. 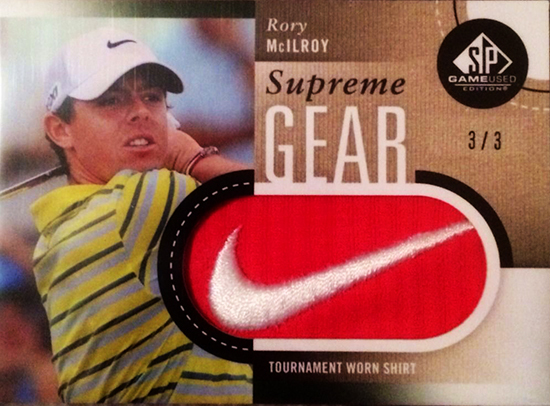 In 2013 SP Game-Used there was a promotional SP-1 card of Rory McIlroy inserted that has been in high-demand with collectors. 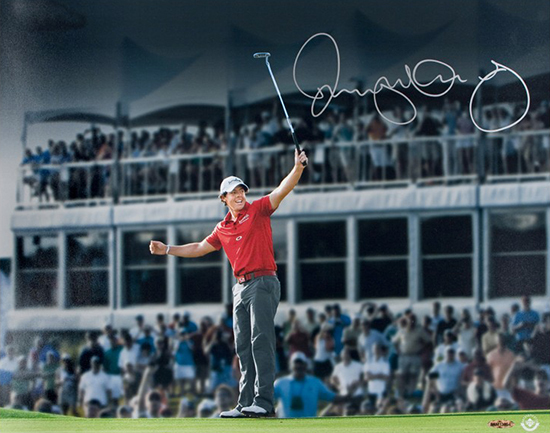 At the National Sports Collectors Convention fans flocked to get one of 5 autographed McIlroy promotional items. 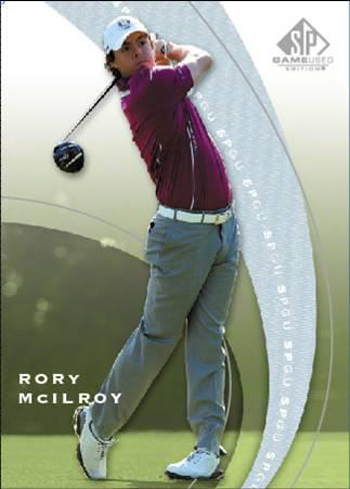 Upper Deck employees were gifted with a special Precious Metal Gems card of McIlroy in 2013. 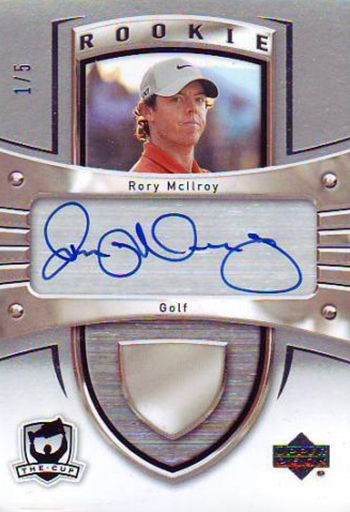 Upper Deck’s NHL The Cup product has a multi-sport insert that has been continuing each year and the Rory McIlroy autograph card limited to 5 copies sells for big $$$$ in the secondary market! 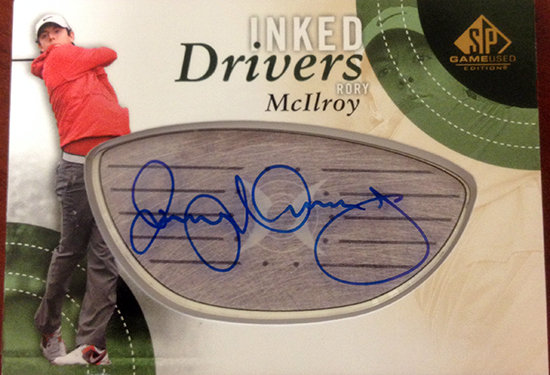 First up this year was the 2014 SP Authentic Autograph Rookie of Rory McIlroy limited to just 299 copies. 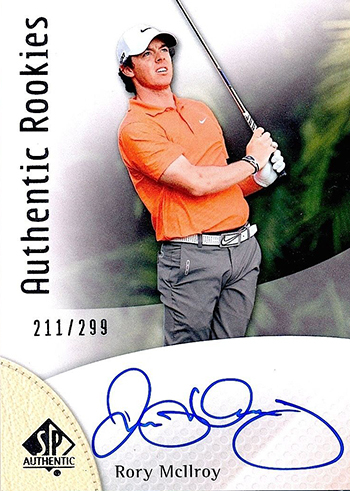 The 2014 SP Game-Used Golf Rookie Autograph card of Rory McIlroy is limited to just 199 copies. 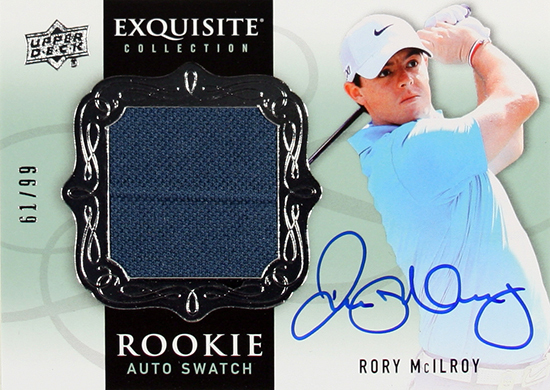 Rory McIlroy’s Exquisite Collection Golf Autograph Rookie Jersey card limited to just 99 copies is sure to be his most sought after rookie card this year! 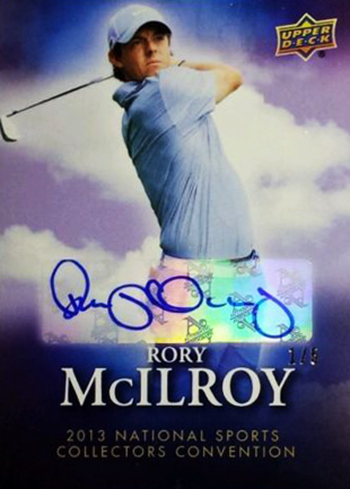 Rory shows off his Exquisite Collection Golf Autograph Rookie card during a signing session. 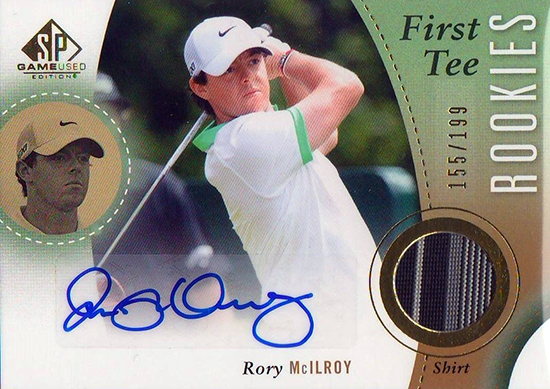 Upper Deck Authenticated Memorabilia – You can see a full rundown of Upper Deck Authenticated Rory McIlroy autograph collectibles at www.upperdeckstore.com. 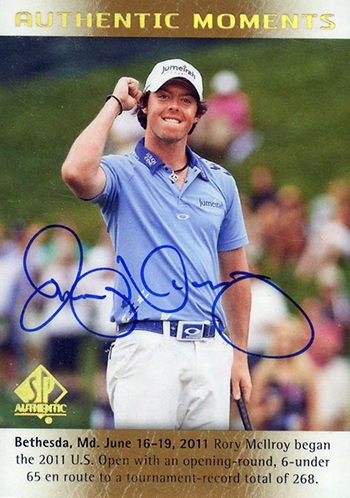 Upper Deck Authenticated goes all out to capture amazing imagery of players like Rory McIlroy. Upper Deck Authenticated also captures those major moments fans will never forget! Innovative collectibles like the Breaking Through pieces really stop fans in their tracks as the range driven golf ball appears to “break through” the glass on the piece. 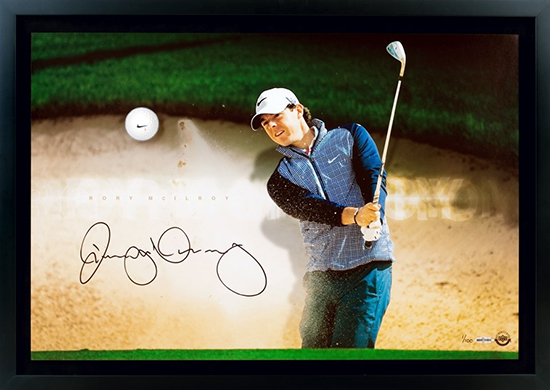 Super rare tournament-worn memorabilia that has been signed and inscribed is the ULTIMATE collectible for any fan of Rory McIlroy. 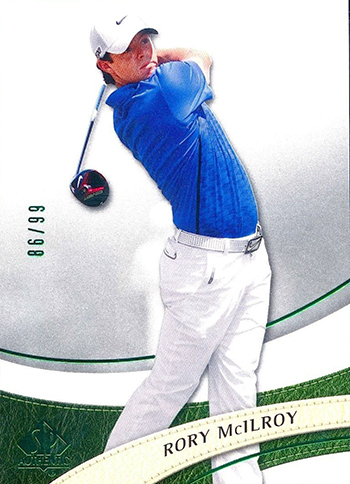 I don’t understand the “Rookie” cards that show pictures of Rory wearing Nike. He didn’t wear Nike when he was a rookie.